As we mentioned a couple days ago, sometimes you have those days where you just can’t seem to think of anything to eat, and yet somehow every single one of your meals ends up tasting delicious! For dinner that day we decided to re-create a childhood favourite- fish fingers! 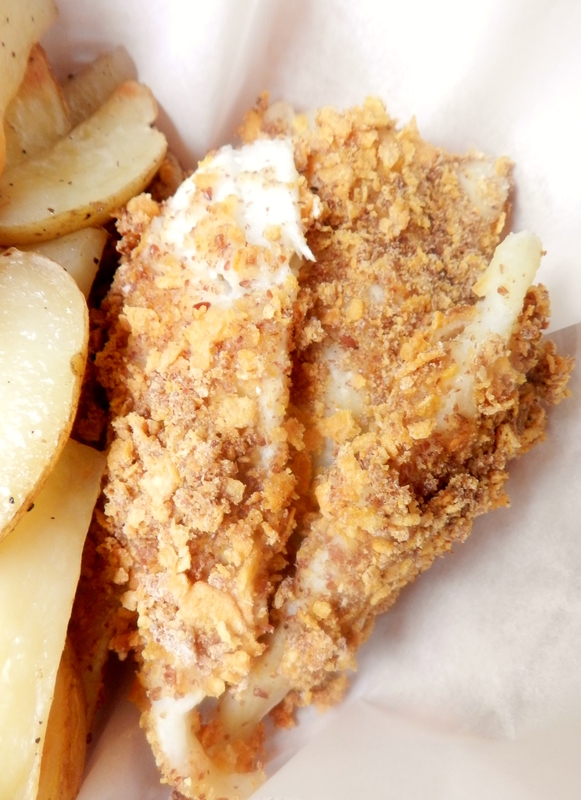 Fish n’ Chips- not exactly a meal that is known for it health benefits, but that’s the fun part, isn’t it? 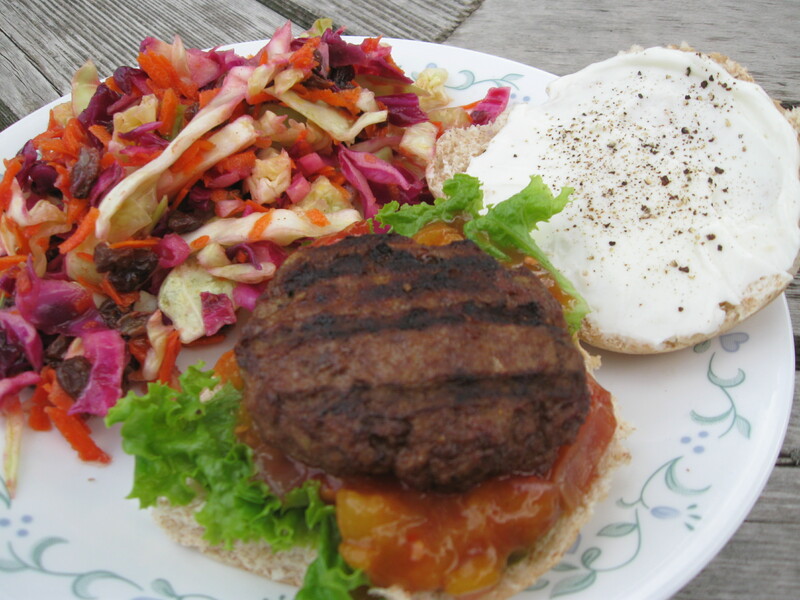 One of our favourite things to do is take a traditionally unhealthy meal and turn it into something nutritious. And of course the fish is only the half of it- you can’t forget the chips! In this case, ours came in the form of baked potato wedges. 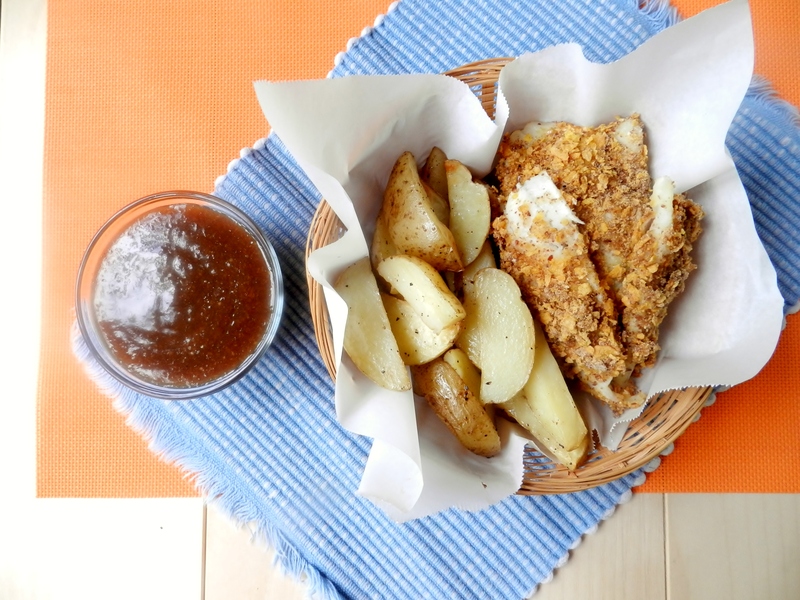 Now, there is a trick to making really good potato wedges. If you don’t want your potatoes to be too soft or mushy, the thing to do is soak them after you cut them up. When we worked as prep cooks in a busy kitchen last summer, their potatoes were always cut up and kept in big buckets of water, so that’s what we started doing. They don’t have to sit in the water forever, just long enough to draw some of the starch out, which is usually a maximum of 10 minutes. 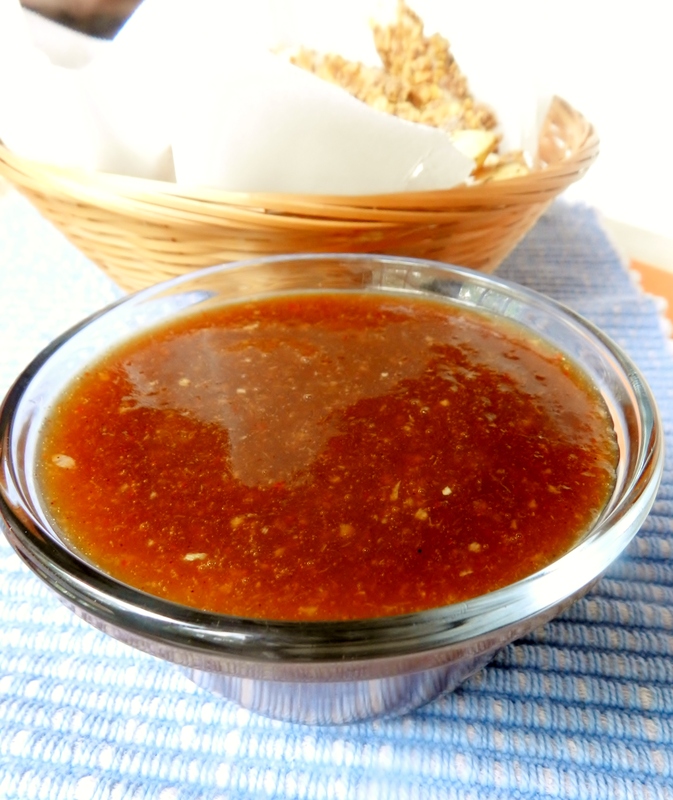 The other key component of Fish n’ chips is plum sauce. Really, who eats fish fingers without plum sauce? We didn’t have plums, though, so we had to improvise. Peaches seemed like the obvious choice, of course! 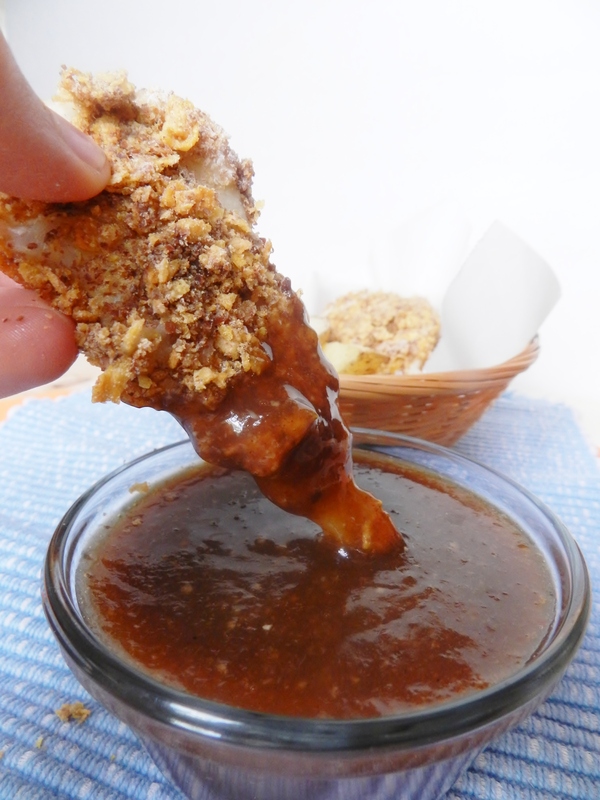 And if we’re being perfectly honest, this dipping sauce was probably the best part of this meal! 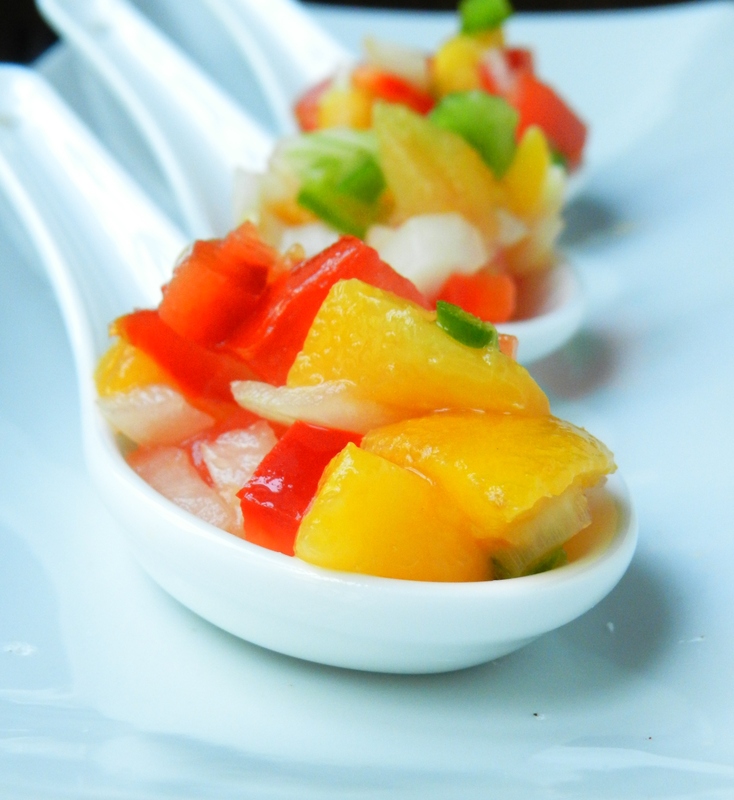 The perfect sweet-and-sour combination! 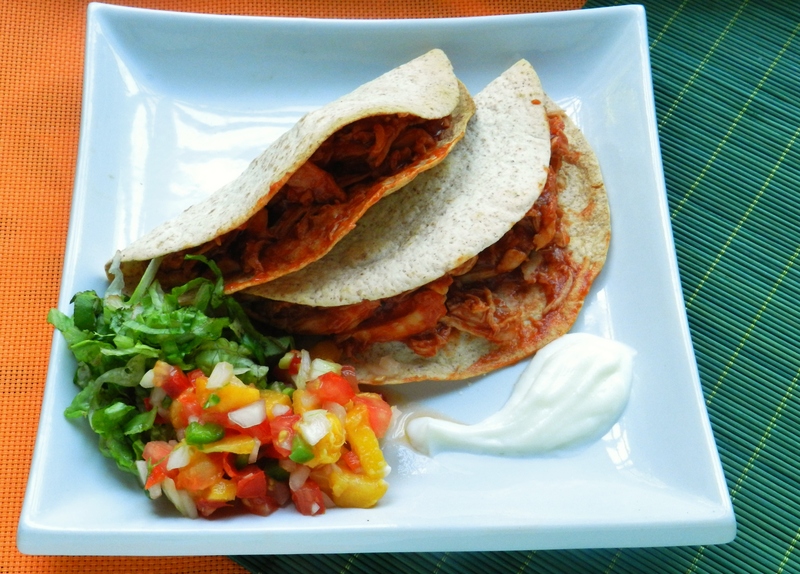 So if you’re feeling uninspired for anything for dinner tonight, give this meal a try! 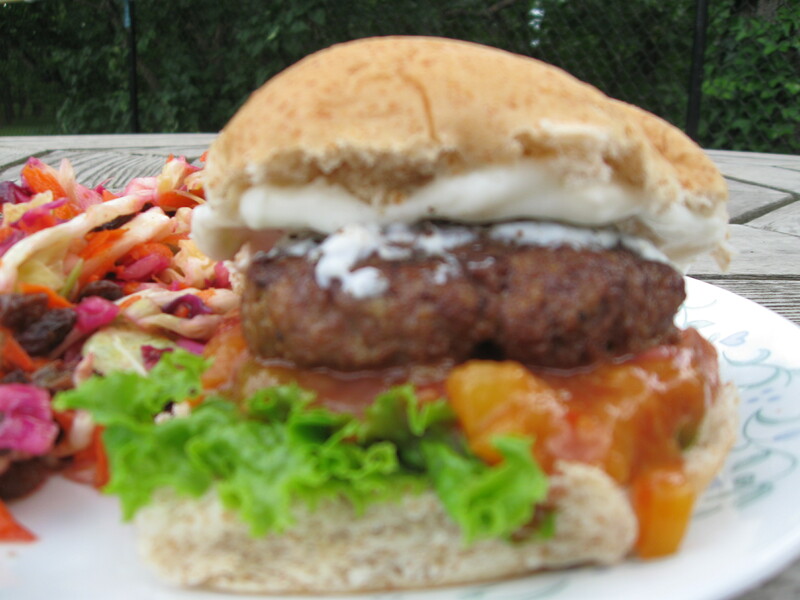 Its fun, easy, and oh-so-tasty. Crush Corn flakes in a large plastic freezer bag until finely ground. Combine in a large bowl with flax seed and salt and pepper. Ina separate bowl, whip egg with water. Pour flower into another bowl. Cut the fish filets into strips. 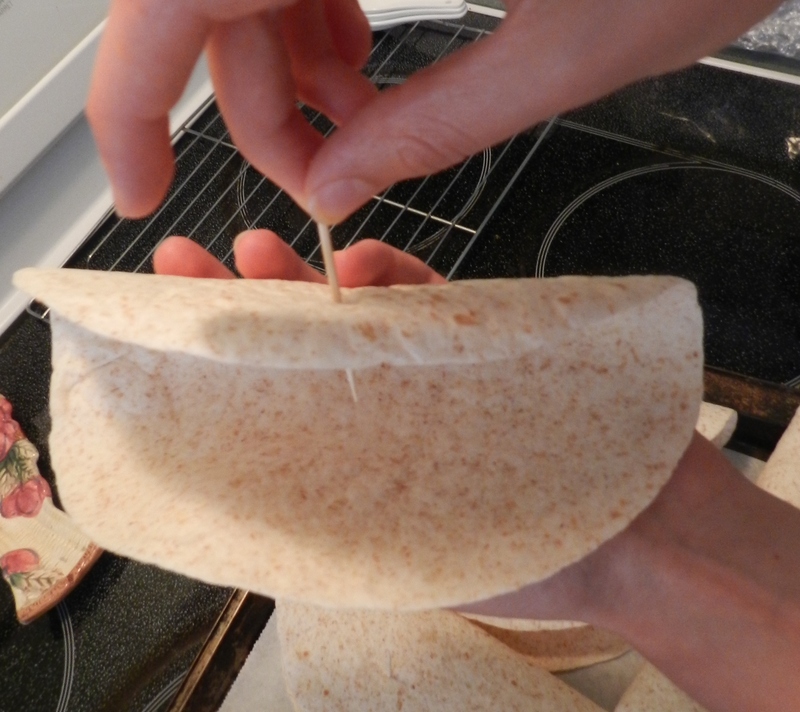 First, dredge the fish strips in the flour until they are completely covered. Then dip the in the egg mixture. 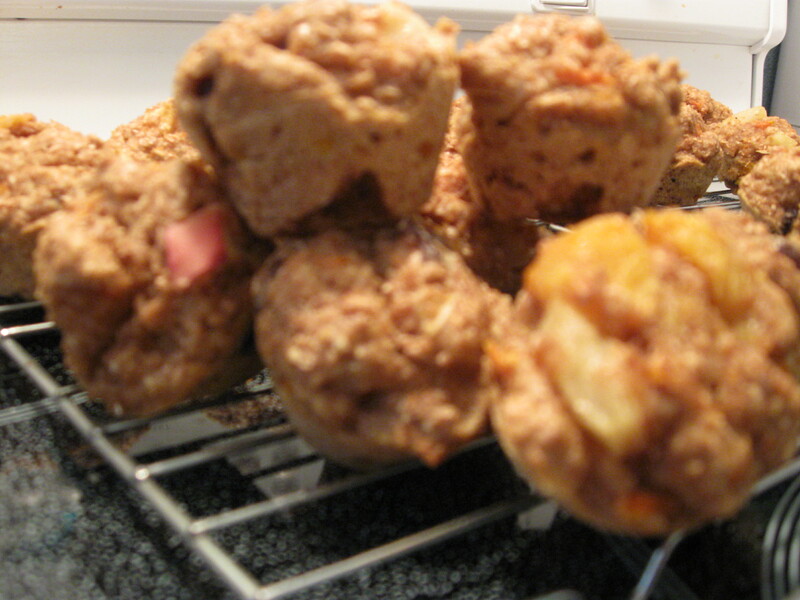 Finally place them in the corn flake mixture and cover them in the corn flake-flax mixture. 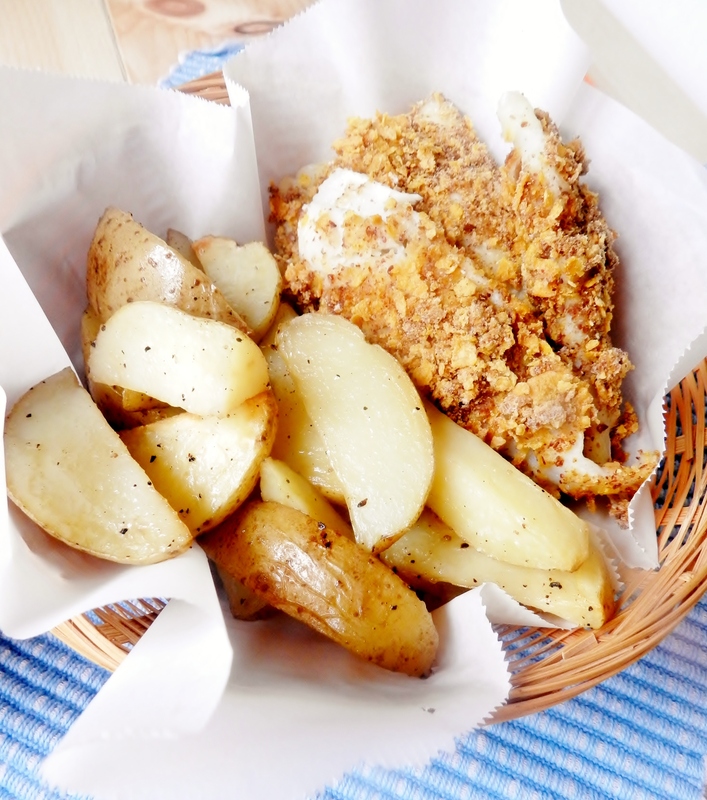 Place on a lined baking sheet and bake at 400C for 10-15 minutes, or until fish flakes easily. Combine all ingredients in a food processor or blender and blend until smooth. Pour into a pot and place on the stove over medium-high heat. Bring to a boil, then reduce to a simmer for about 5 minutes, or until thickened. Do you like fish fingers? 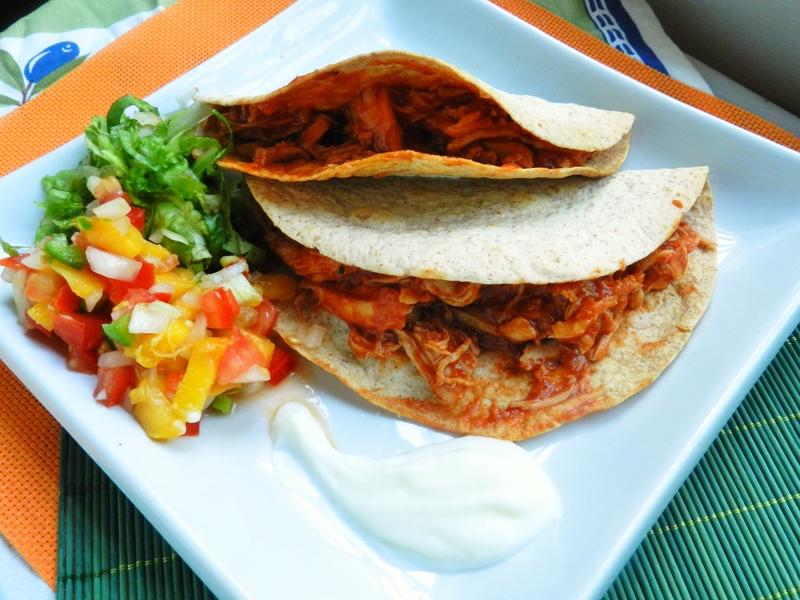 What is your favourite traditionally unhealthy meal that you like to give a nutritional makeover? Posted in Uncategorized and tagged chips, corn flakes, dip, fish, fish and chips, flax, healthy, peach, plum sauce, potatoes, sauce. Bookmark the permalink. 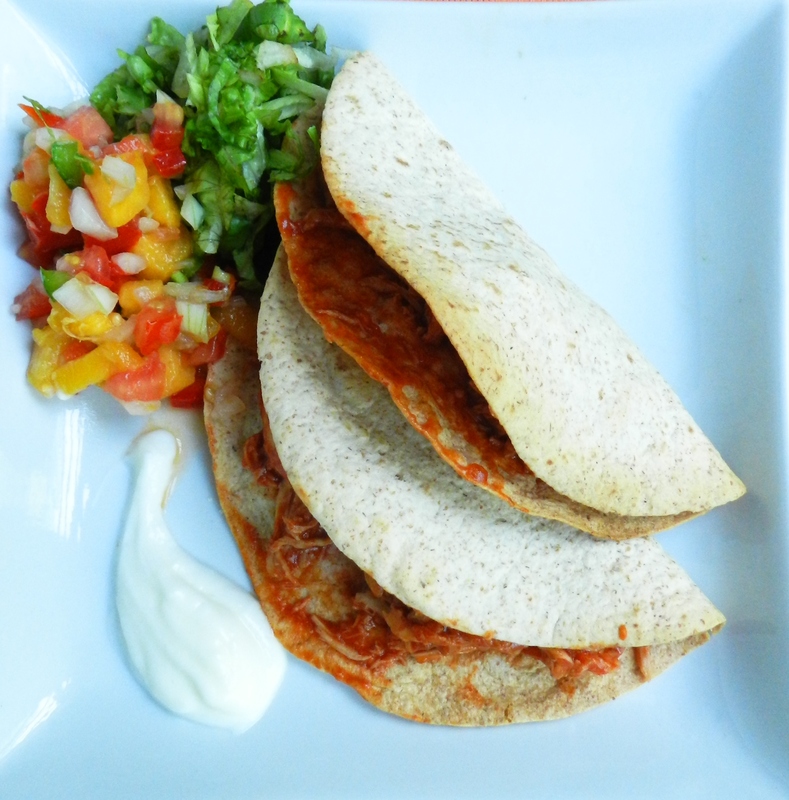 And we’re back for our 2nd-ever What I Ate Wednesday! And there is absolutely no fruit that epitomizes August in Niagara more than peaches! Seriously, we don’t think we’ve ever had a peach out-of-season. Every time we see them in the grocery store in the middle of winter, we get the temptation to pick up a pack, but then we come to our senses. We just couldn’t do the peach such an injustice. Truly, peaches are the Kings of summer. And you know what else is not a summer staple, but a year-round must-have? Pancakes! 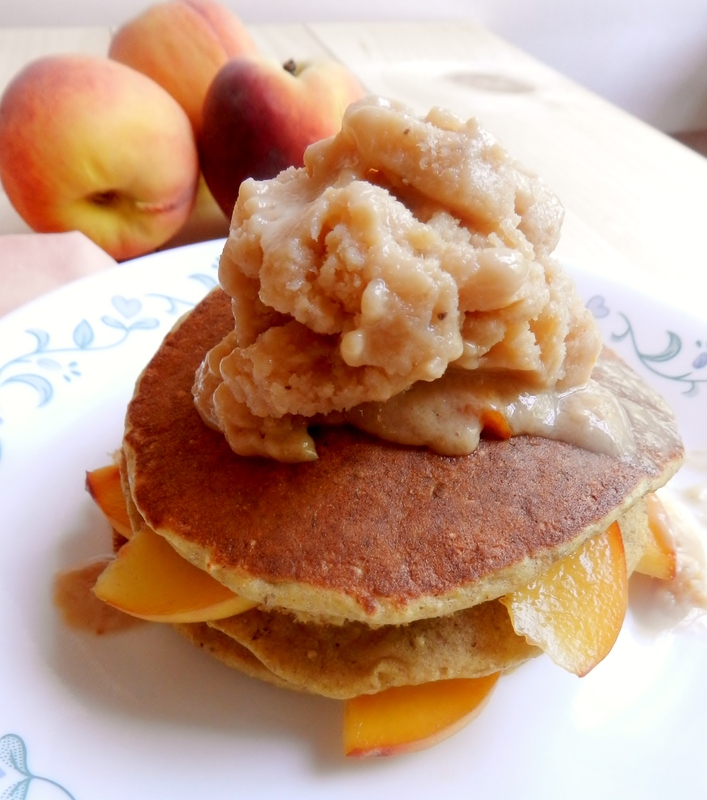 Summer staple + year-round staple = peach pancakes. But not just any peach pancakes. 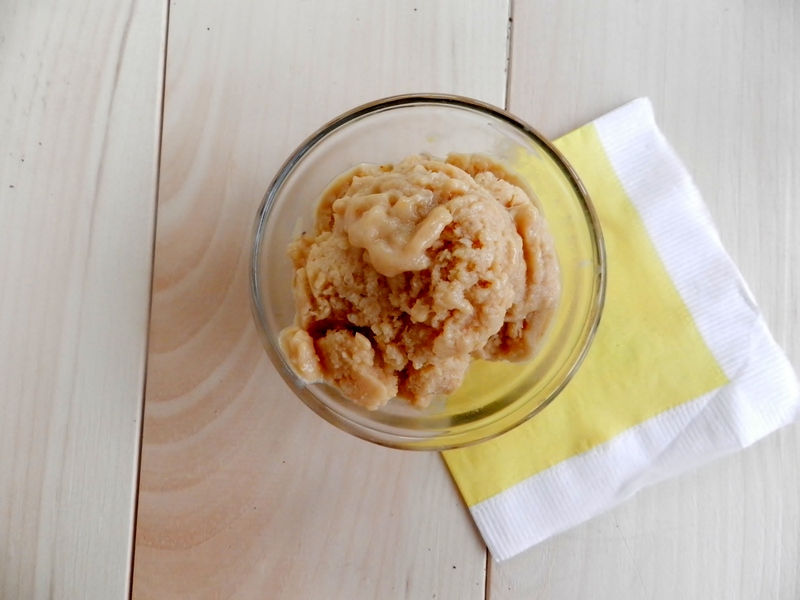 No, we decided to throw another summer staple into the mix- ice cream! Yes, these pancakes were served A La Mode. Ok, ok, we know that most health professionals will tell you to avoid anything smothered in ice cream, particularly at breakfast. But we heartily disagree. 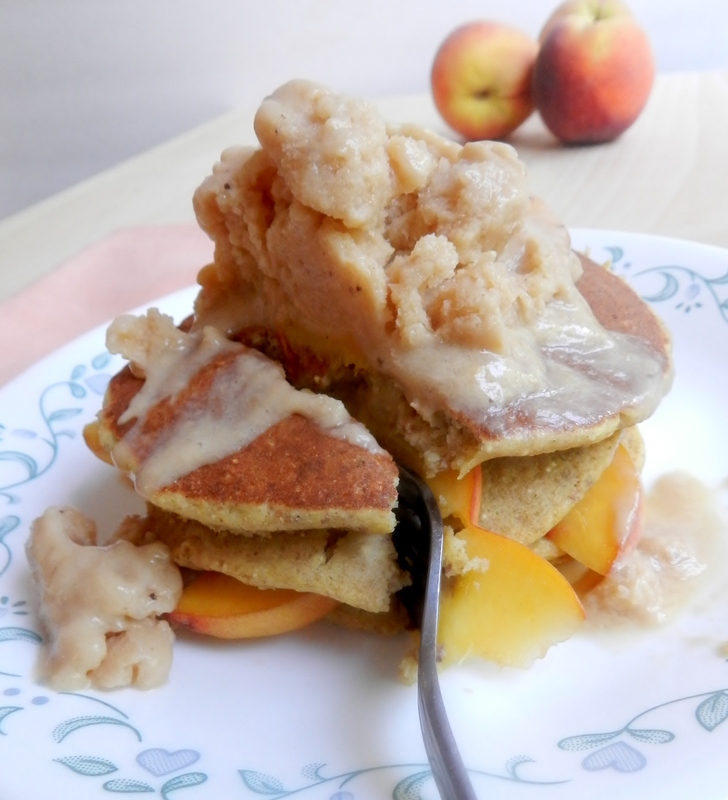 Mostly because topped with our peach-banana ice cream, these pancakes are actually super-healthy! Seriously people, these pancakes were decadently delicious! In fact, we’d say these rival our blueberry banana pancakes– and that’s saying something! 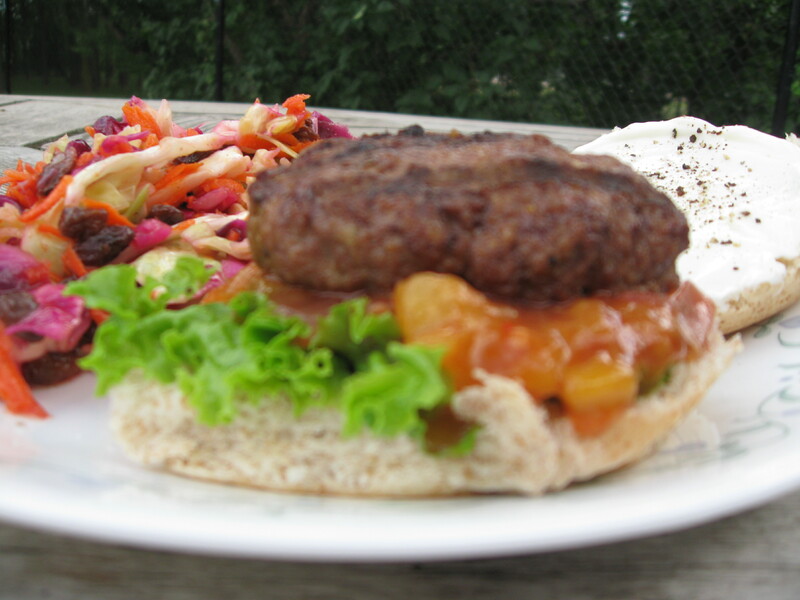 They were fluffy and tender, and simply bursting with peach flavour! And nothing beats a hot stack of pancakes topped with cool, creamy ice cream, melting all over the place and soaking into each layer, infusing your stack with even more peach flavour. 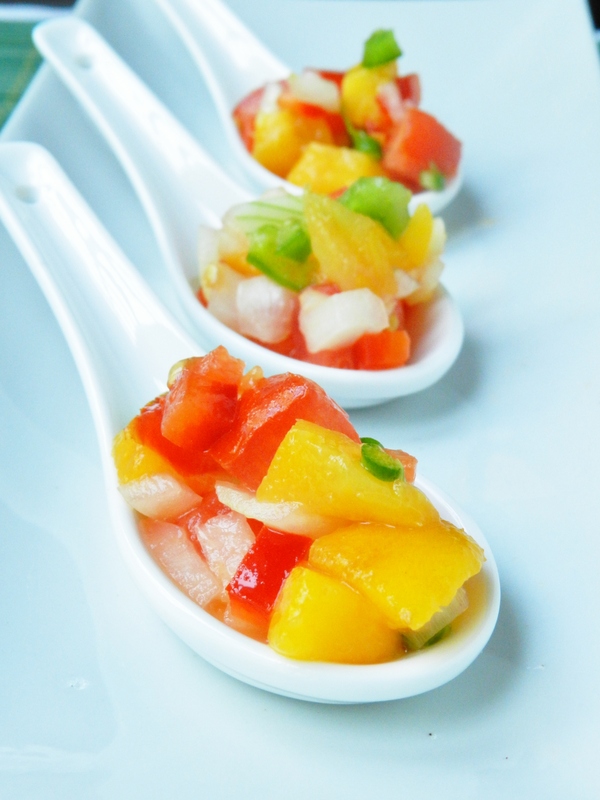 And of course peaches have found there way into several salads, sandwiches, and a host of other savoury and sweet dishes that remained un-photographed. 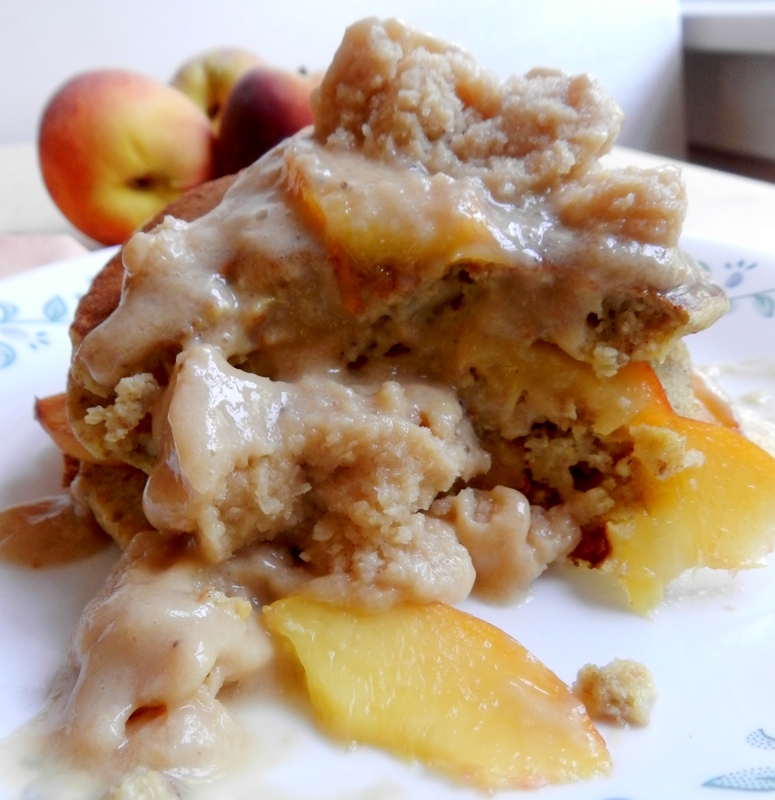 Anyways we won’t torture you any longer, so without further ado, peach pancakes a la mode! Heat large pan or pancake grill. 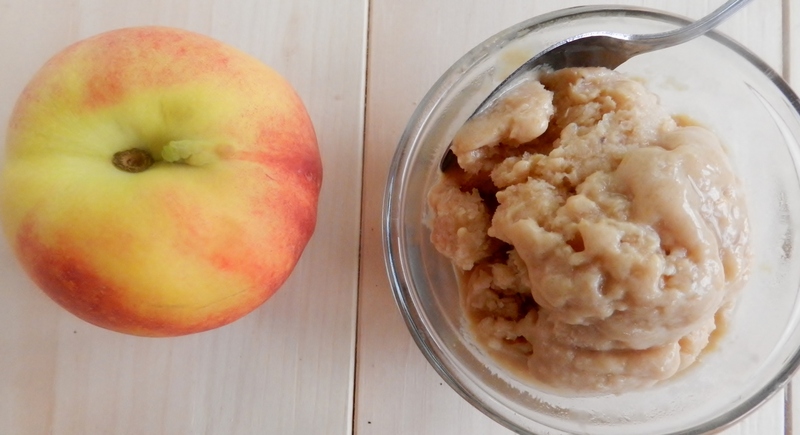 Place peach chunks into food processor and process until crushed and fairly smooth. Add all other ingredients to the food processor and blend until fully combined. Add wet ingredients to dry ingredients and stir until just combined. Drop large spoonfuls of batter at a time onto the griddle and cook until bubbles begin to form, then flip and cook for a few more minute on the other side. 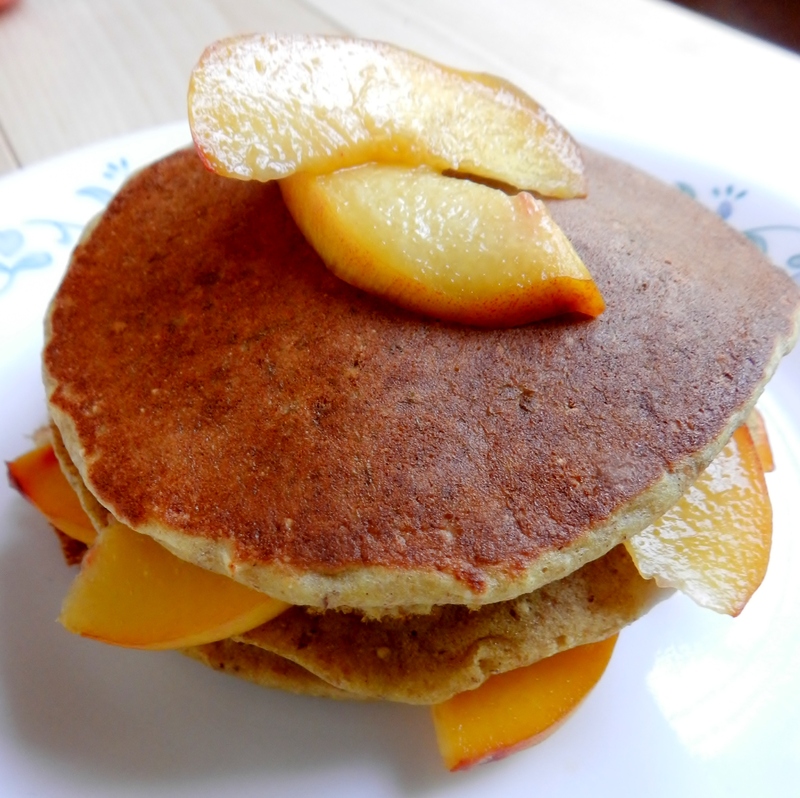 Stack your pancakes and layer with sliced peaches. Top with ice cream and devour. * separating your egg and whipping the white into stiff peaks will make your pancakes even thicker and fluffier. We were going to do that but our yolk broke. Oops! ps- congratulations to Adam van Koeverden for his silver in kayaking, Mark Oldershaw for his bronze in canoeing, Ryan Cochrane for his silver in the 1500m freestyle swim, and Dereck Drouin for his bronze medal in high jump! Go Canada! Do you like peaches? What is your favourite summer fruit? 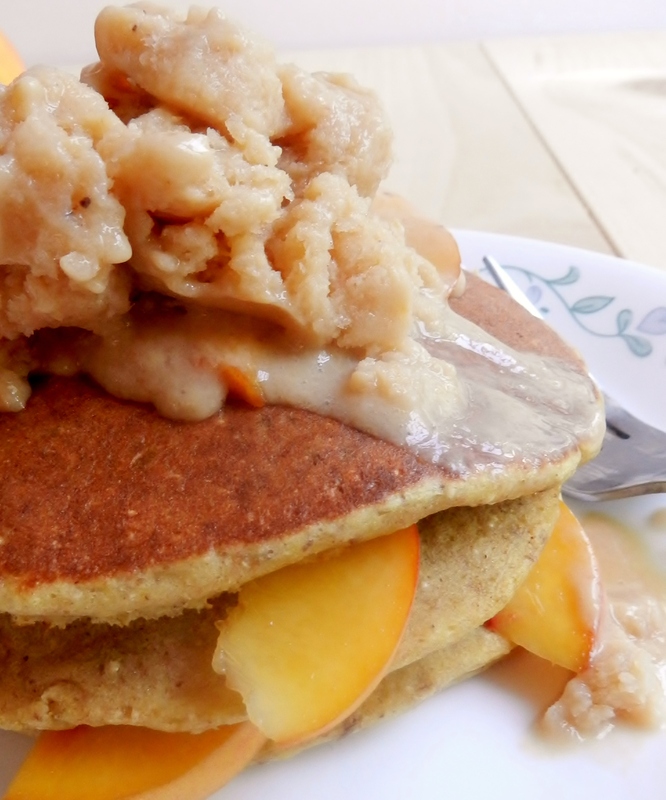 Posted in Uncategorized and tagged a la mode, breakfast, healthy, ice cream, pancakes, peach, summer, what I ate wednesday, whole grain. Bookmark the permalink. When it comes to kitchen appliances and gadgets, Julie and I have a long wish list. It includes a food dehydrator, a mandolin, a rice cooker would be nice, and honestly I think our lives would be complete if we had a Vitamix. 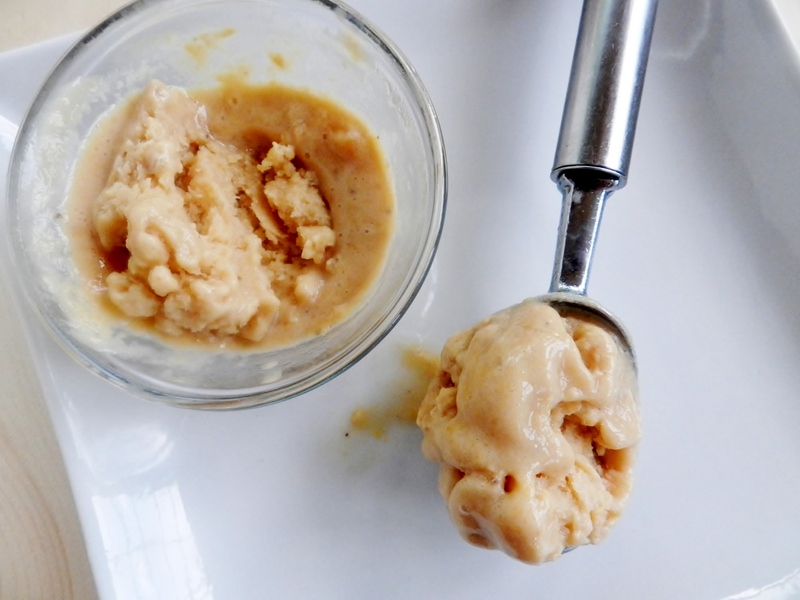 But all summer we have found ourselves constantly wishing we had one thing: An ice cream maker! All you have to do is peruse foodgawker or tastespotting for a couple minutes, and I guarantee your mouth will be watering over all the delicious ice cream creations that some amazing food bloggers have come up with. And for some reason, I click on them every time to read the recipe and imagine how awesome it would be to make my own version at home. Apparently I really enjoy torturing myself. You can imagine my excitement then, when I find recipes that don’t use an ice cream maker. I do a little happy dance all the way to the kitchen. So of course, Julie and I had to come up with our own version. And of course it being August in Niagara, it had to be peach flavoured. 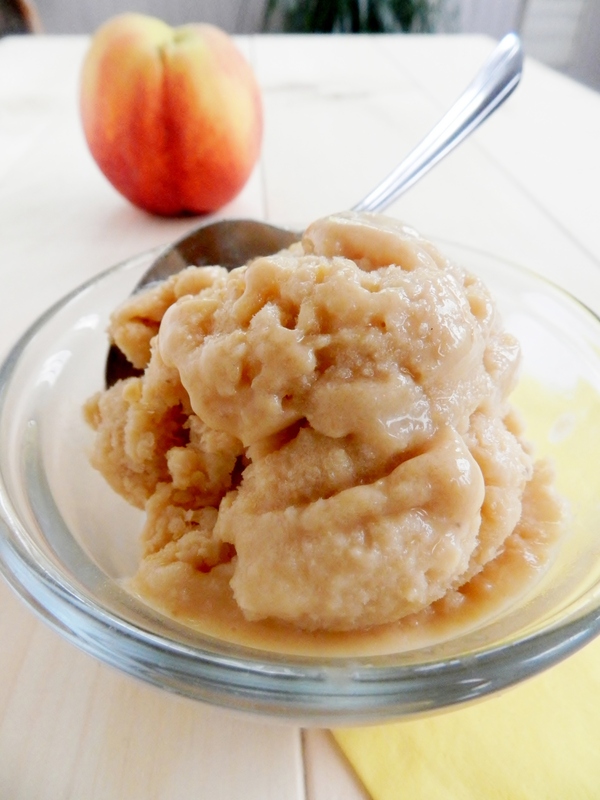 And of course both of us having a slight obsession with bananas, they too fell into the mix, and given the nature of this blog, this “ice cream” is healthy, too! 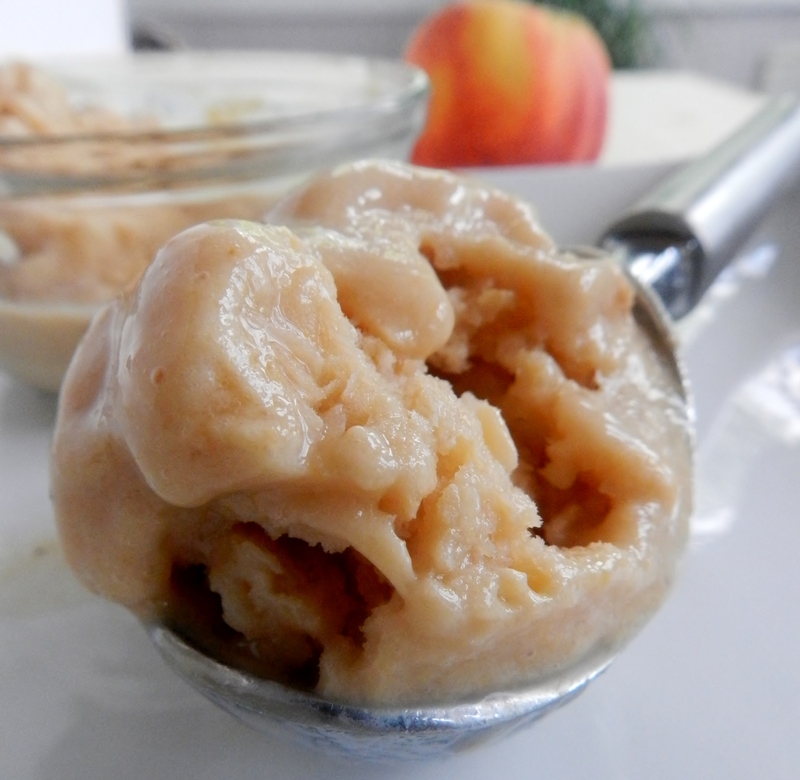 Healthy peach and banana ice cream that doesn’t require an ice cream maker? I don’t know about you, but I’m sold! Combine all ingredients in a food processor and blend until smooth. Pour mixture into a container with a tight-sealing lid and place in the freezer for 2-3 hours or until frozen. 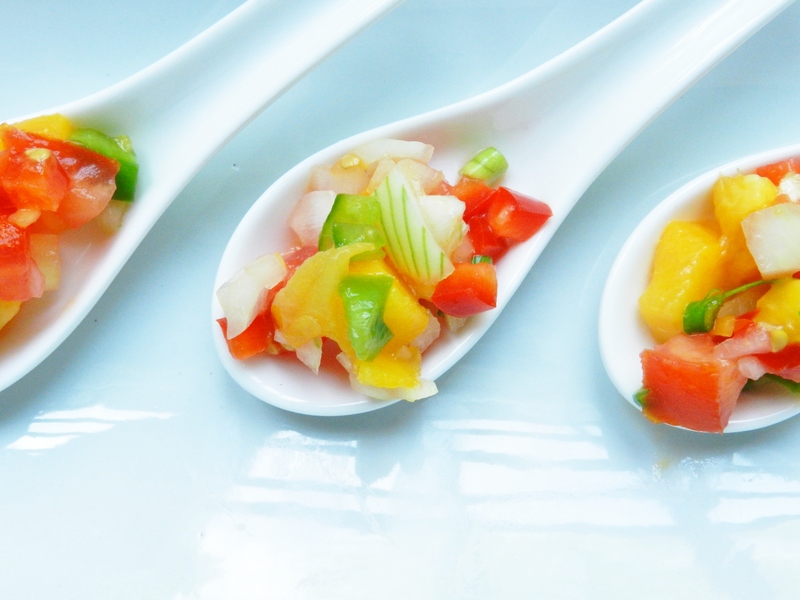 Remove container from the freezer and allow to sit at room temperature for 10-15 minute to thaw slightly. Using a knife or fork, roughly brake up the frozen mixture and return to the food processor. Pulse the ice cream a few times or until you are able to scoop it up with and ice cream scoop. Do you like ice cream? Are you lucky enough to have an ice cream maker? 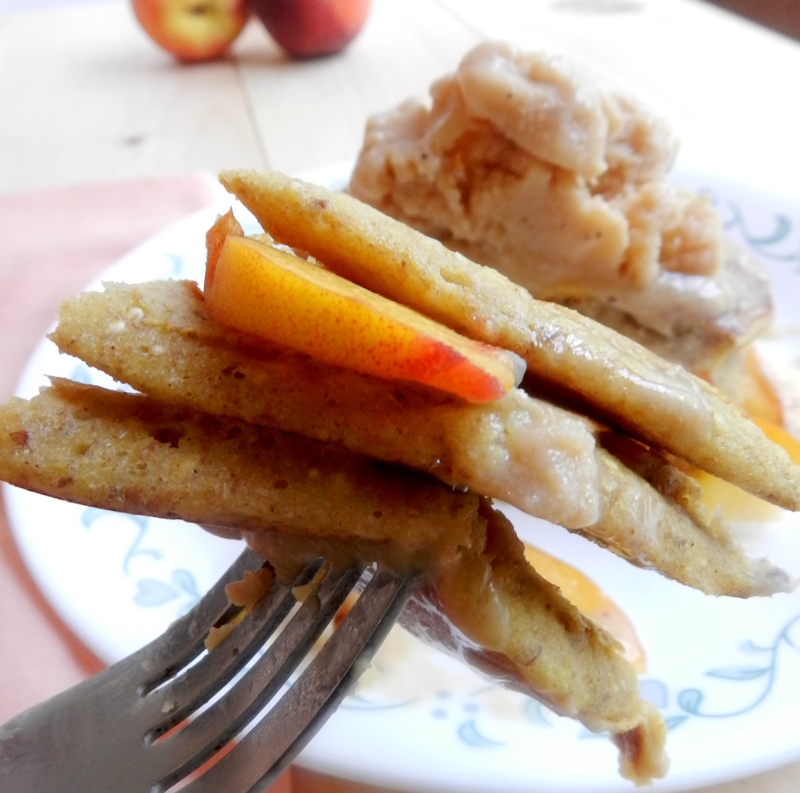 Posted in Uncategorized and tagged banana, healthy, ice cream, no-bake, peach, summer. Bookmark the permalink. Several years ago, we saw a McDonalds billboard that said “Dinner is a long way from lunch”. We heartily agree! It was an advertisement for their snack wraps. Different ad, but we still agree! We’ve never actually had a McDonalds snack wrap, seeing as we don’t go there often ever. But we do enjoy snacking, and believe that healthy snacks are an important part of the diet. It is a long way from lunch to dinner, and who doesn’t love snacks? Having a healthy snack in the afternoon can help to prevent you from over eating in the evening, as well as provide you with some good nutrition. The easiest way to have healthy snacks is to prepare in advance. We like to make a bunch of healthy snacks that we keep in the fridge that we can throw in a lunch bag/pop into our mouths as we head out the door! They’re also great if you’re having a “hungry day” and need an extra little boost. So we bring to you: Mini Muffins. Easy to throw into a bag and bring along, easy to toss in your mouth snack hole while you’re out and about, and a great little whole grain treat to tie you over until dinner! We’re calling these “everything” muffins, because they have a little bit of a lot of stuff in them. With the chai spices and whole wheat flour, these little guys are big on flavour and fiber, and are pretty cute to boot! In separate bowl, combine wet ingredients. Add to dry. 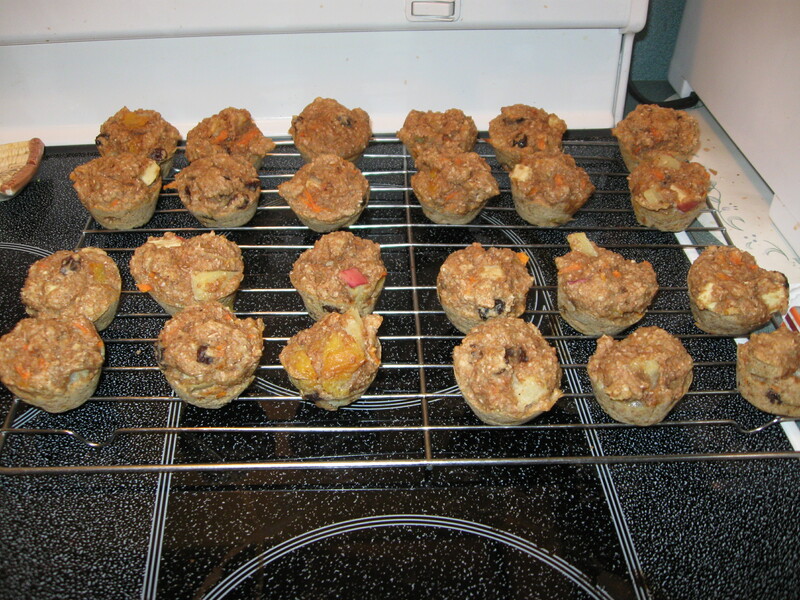 Spoon batter into 24 prepared min muffin tins. What do you like to have for snacks during the day? Posted in Uncategorized and tagged apple, bake, bran, carrot, chai, everything, fiber, healthy, muffins, peach, pineapple, snacks, whole wheat. Bookmark the permalink. Don’t you think if your breakfast looked like that every morning, you’d have no problem waking up, regardless of what time it is? With a breakfast such as this, it’s impossible to have a bad day (or at least a bad morning). 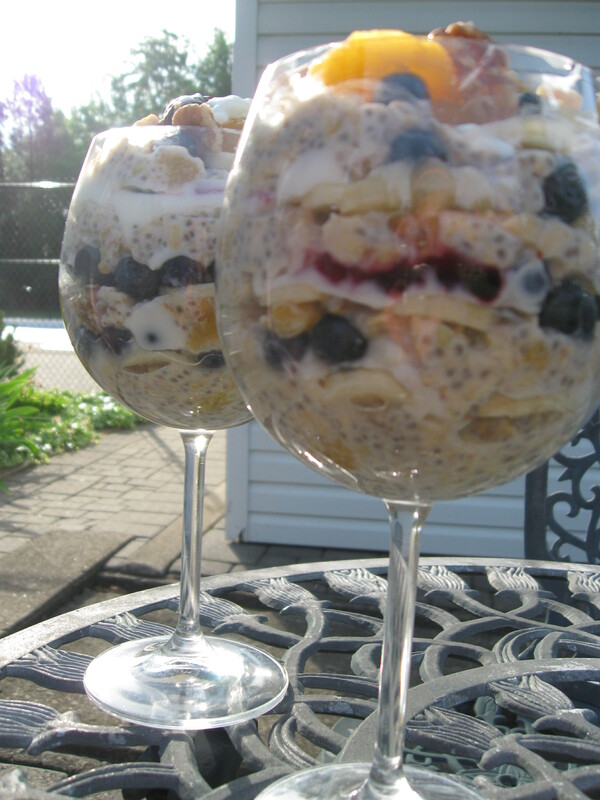 Overnight oat parfaits are a staple in our breakfast line-up. They have the creaminess of oatmeal, but are cool and refreshing, perfect for a summer any morning! They’re especially good if you know you have a busy morning, because most of the preparation happens the night before, and you can even pack them up and take them with you because they won’t leak! On our last trip to the grocery store, they had blue berries on 2 for $5! Imported, but still delicious. And on a student budget, we won’t pass up on-sale berries! We didn’t want to take away from the fresh blue berries by baking them into something, and with home-canned peaches (courtesy of our lovely Aunt Joan) in the fridge and a bunch of perfectly ripe bananas on the counter, did we really have any other option? 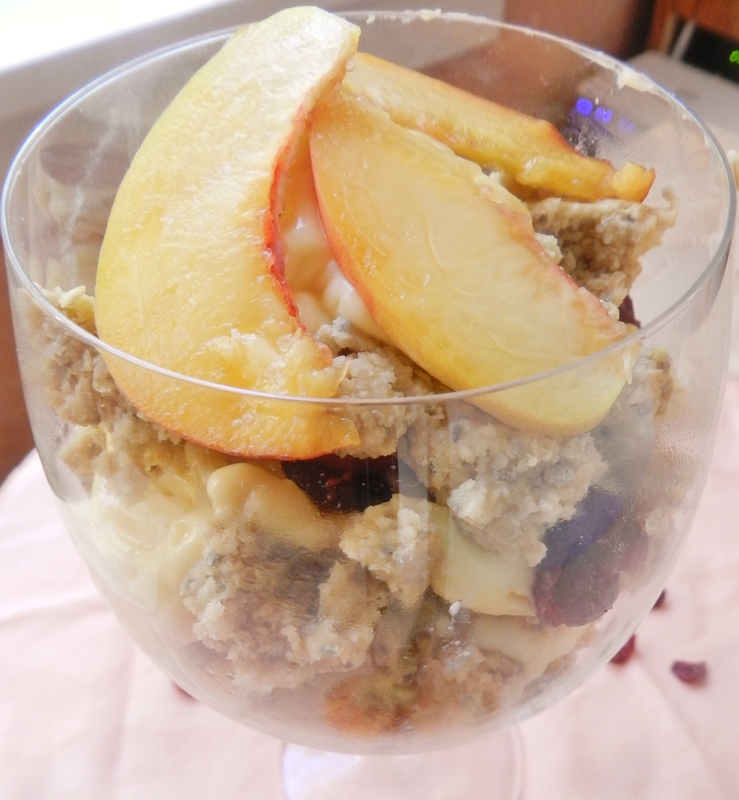 This parfait was ultra-creamy, and the layers of fruit bursting through were so bright and refreshing- we think that this may be one of the best parfaits we’ve ever made! The night before, combine the oats, buckwheat groats, and chia seeds in a bowl. 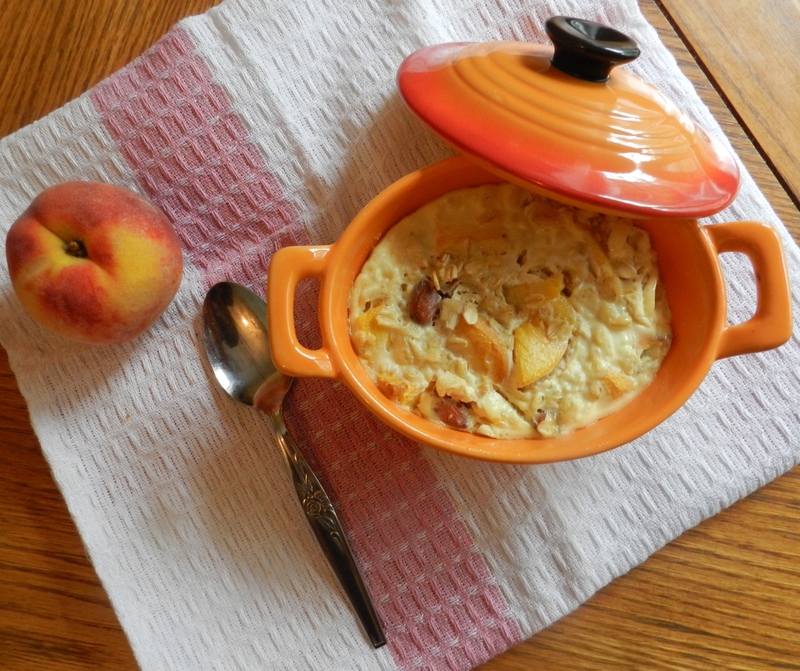 Add the peach juice, milk, yogurt and chopped peaches. 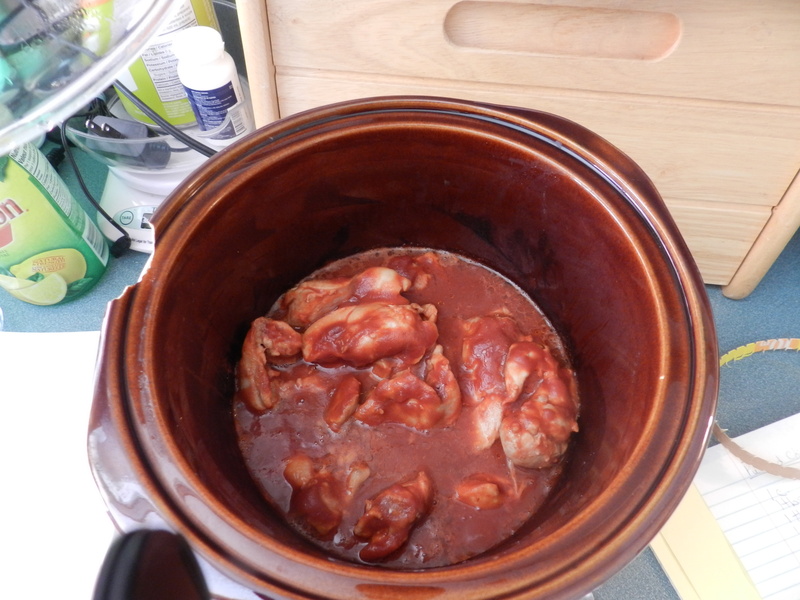 Cover and place in the fridge to sit overnight. In the morning, stir in the walnuts. In a large cup/jar/wine glass etc, spoon a layer of the oat mixture in the bottom. Top with layers of banana, blueberries, yogurt, and jam. Repeat until you’ve run out of oats! 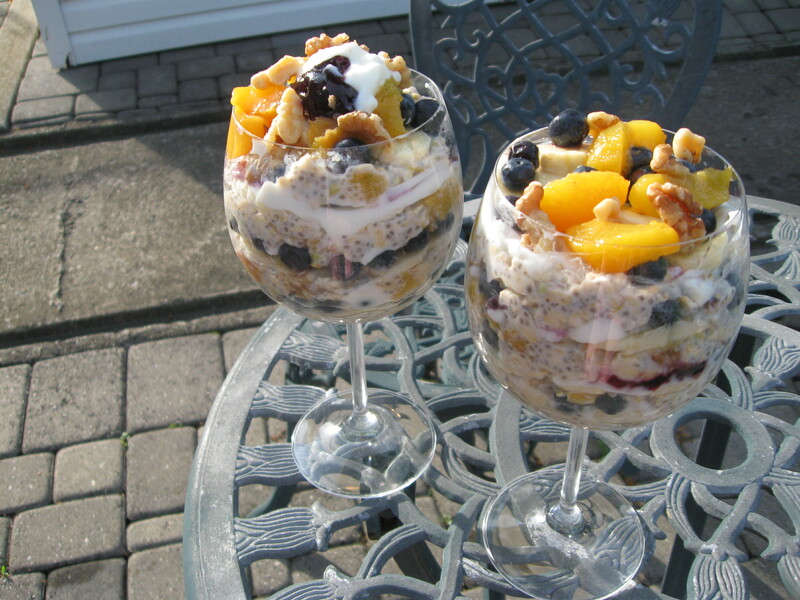 What’s your favourite quick or summertime breakfast? 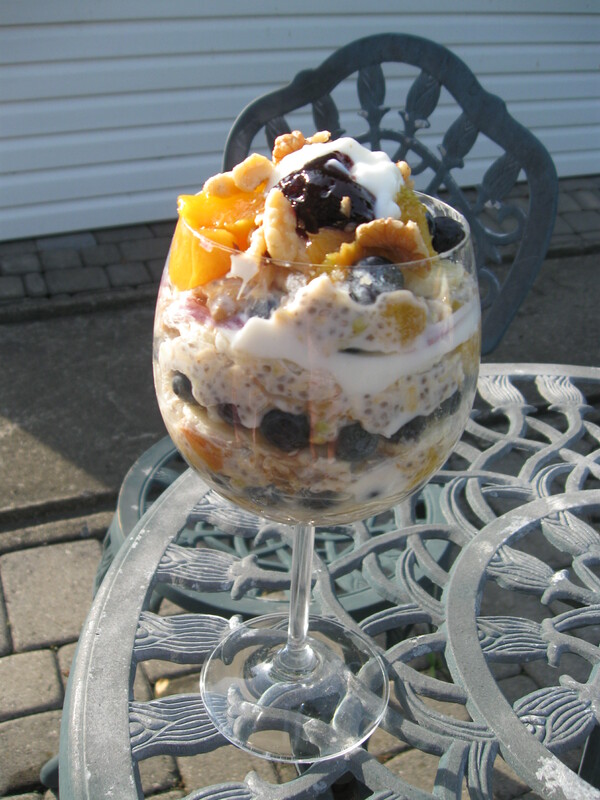 Posted in Uncategorized and tagged banana, blue berries, breakfast, chia seeds, healthy, oats, overnight oats, parfait, peach, raw oatmeal, walnuts, yogurt. Bookmark the permalink.